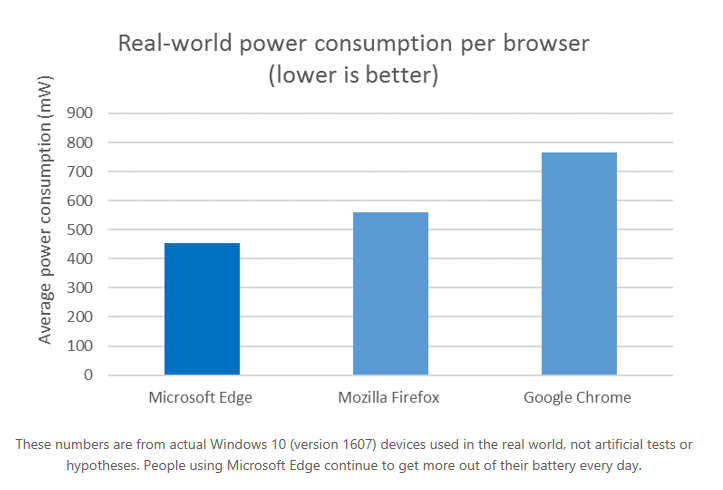 Microsoft has published a report comparing their newly updated Microsoft Edge browser against the competition and the results indicate that it is far more battery friendly than other browsers out there. The report is similar to one that the company ran in June and this new report is based on the updated version of Edge in what is commonly referred to as the Anniversary Update of Windows 10 (Build 1607 for those keeping score). The results indicate that Edge has seen some dramatic improvements since the release of the update. That is pretty impressive no matter how you cut it but Microsoft went much deeper into their research, offering both lab and real-world data to back up their claim. tests using Netflix and Edge outlasted the latest version of Chrome (53) by some 90 minutes. Perhaps the most interesting part of the test is that it wasn’t all done in a lab. Rather, Microsoft used real browsing information from real users in the real world and looked at their aggregate power usage on Windows 10 devices. The results of this test mirrored the lab tests the company performed. As a heavy Chrome user, the report somewhat backed up what I already thought. Chrome isn’t exactly battery efficient although it has significantly improved. And truthfully, I like Microsoft Edge. It is a fast, sleek browser with its only shortcoming being that there very few extensions for it. That’s improving but still well off what Chrome can offer. Looks like round two of the Browser Wars is getting heated up!